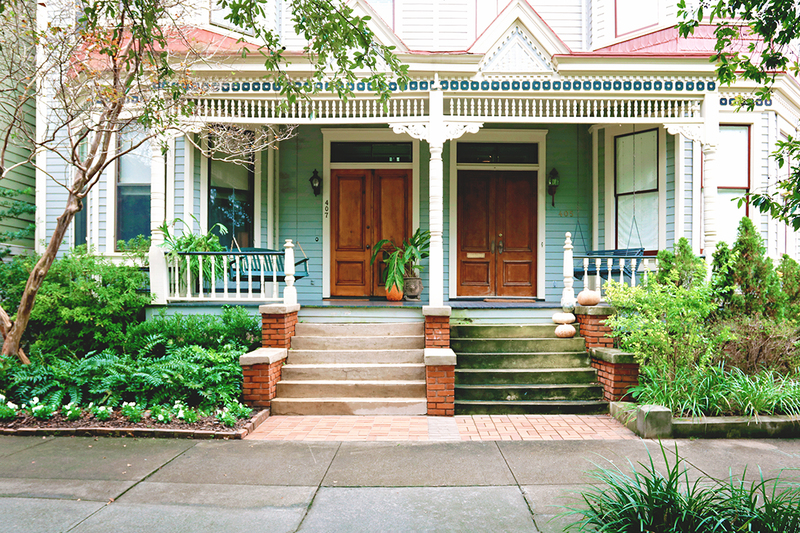 Savannah’s Stunning Victorian District Will Give You Front Porch Envy! It's true! 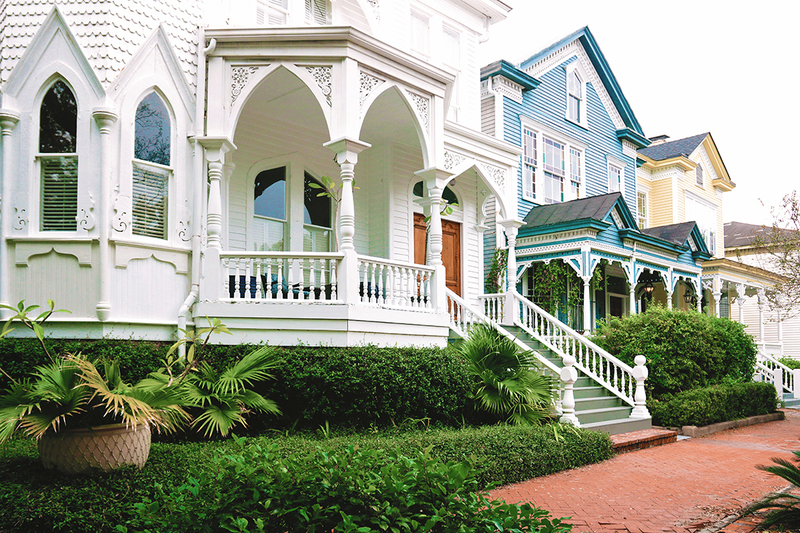 Even a quick stroll through the Savannah Victorian District is slightly jealousy-inducing — although not in a bad way. If you're anything like me, you'll probably immediately picture yourself relaxing on one of the fancy front porches with a glass of sweet tea in-hand, doing your best “Hi, neighbor!” wave as nearby residents stroll by. 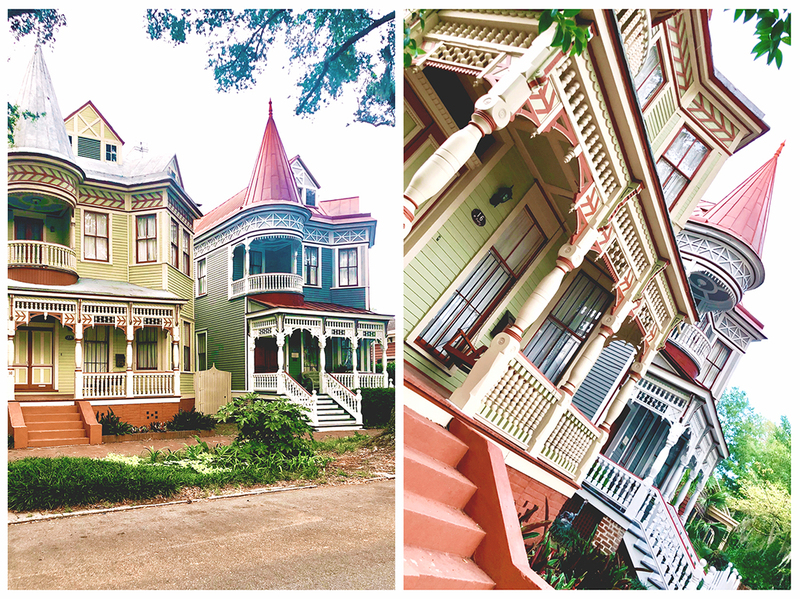 If you're headed to Savannah anytime soon and are curious to know what the Victorian District looks like and whether or not it's worth adding to your itinerary, my goal is to help answer that question for you! If you find my tips helpful, please share this image on Pinterest! The first question you probably have is, “Where exactly IS the Victorian District in Savannah?” It's located directly south of the Historic District between Gwinnett Street (the northern boundary) and Anderson Street OR 31st Street (the southern boundaries). The east-west boundaries are marked by Montgomery Street and E. Broad. Bull Street is the center dividing line. It cuts directly through the center of Forsyth Park. FYI: You'll find LOTS of Victorian-style homes mixed into the areas directly north and south of the true Victorian District. 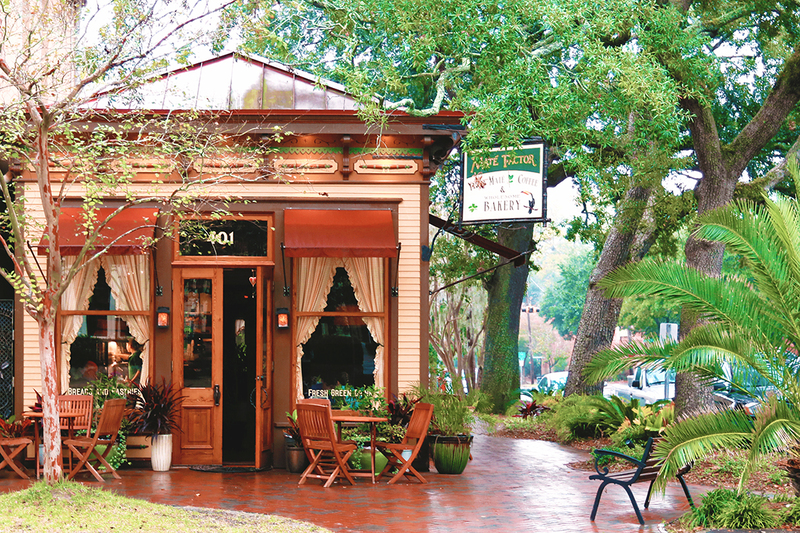 It's a popular home style throughout Savannah. Wondering why the homes are referred to as “Victorian”? It's because they were built during Queen Victoria's reign from the 1830s to the early 1900s. Victorian homes are generally pretty elaborate and often have characteristics that make them look like life-sized dollhouses. Enough of the boring history lesson, let's get to the pretty pictures! The white house almost looks like it should be a church instead of a house, don't you think? If I ever wrote a book about Victorian-style homes, I'd put this one on the cover. I've never seen the interior of it, but I'd jump at the chance if the opportunity ever presented itself. If it ever goes on the market, you can bet I'll be first in line to tour it! The three homes above are located on E Gaston Street, in case you're trying to locate them. 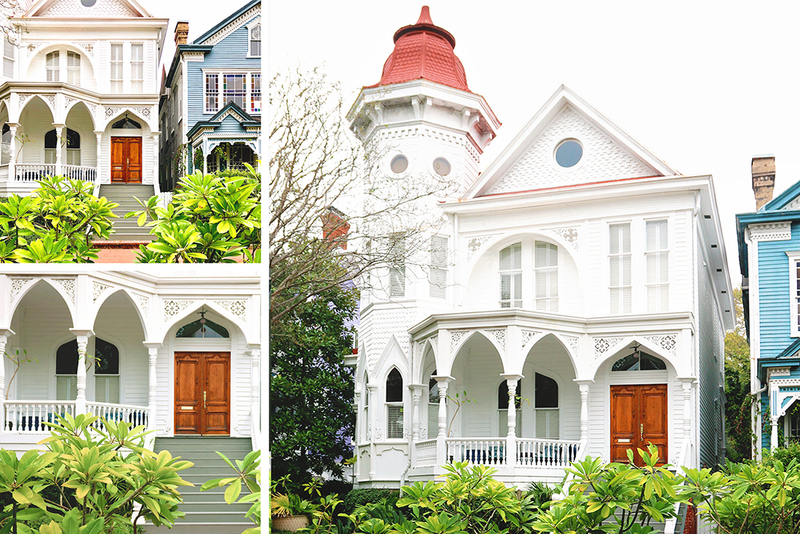 The white one is one of my top 5 favorite houses in Savannah, so it's worth seeing in person if you can! The moulding near the roofline on each of these homes is called dentil moulding, but it's commonly misspelled as “dental” — which is understandable since it resembles rows and rows of teeth! The single-story front porch with decorative trim and ornamental spindles was a common design element in Victorian homes. I love the two front porch swings! It's very common in Savannah to see people sitting on their porches in the early evening hours, usually with a book in-hand. The trim on the porch to the left is just one of many examples you'll find in the Victorian District, and I love the cheerful blue paint on the homes. Check out the pretty detailing on those stairs! Brick sidewalks are standard throughout much of Savannah, but they look especially appealing once the moss starts growing on them. The street I live on is still paved with the original bricks, and I love when the greenery grows through after a good rain. 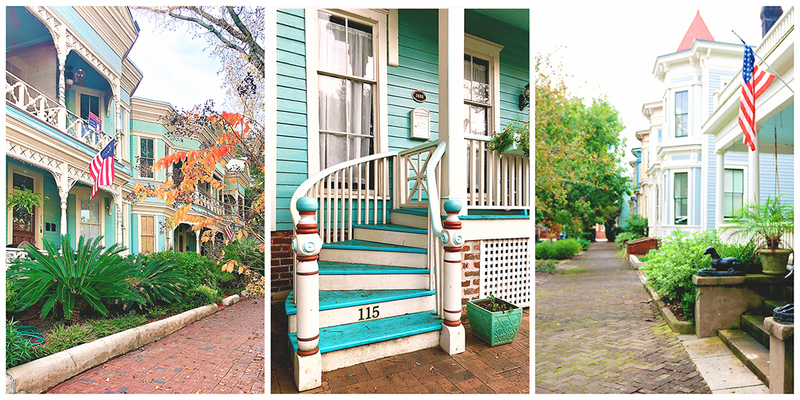 Little details like the moss-covered sidewalks are one of the reasons people end up falling in love with Savannah after a visit; it's feels homey and comfortable — like you've been away for a while and are returning to a familiar place. I notice new details every time I pass by this one! There's so much going on with it that it's hard to take everything in at once. As pretty as it is during the daytime, I also really love it at night. The curved portions above the windows on the porch contain giant pieces of stained glass, and they look beautiful when they're all aglow! One of my favorite books about Savannah that I reach for over and over again is Jonathan Stalcup's Savannah Architectural Tours. This is one of the homes discussed in the book, so I know it's a multi-family home built by the McMillan brothers and that it showcases a very eclectic mix of styles. As Jonathan points out, the multi-colored bricks are inspired by High Victorian Gothic architecture. 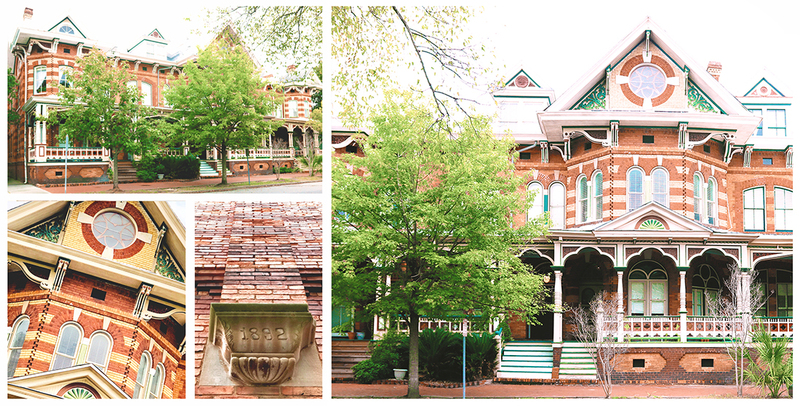 The home also includes elements from Romanesque Revival, Italianate, and Queen Anne styles. I nicknamed it the “Everything House”, because it looks like the architects tried every popular trend they could think of when building it. 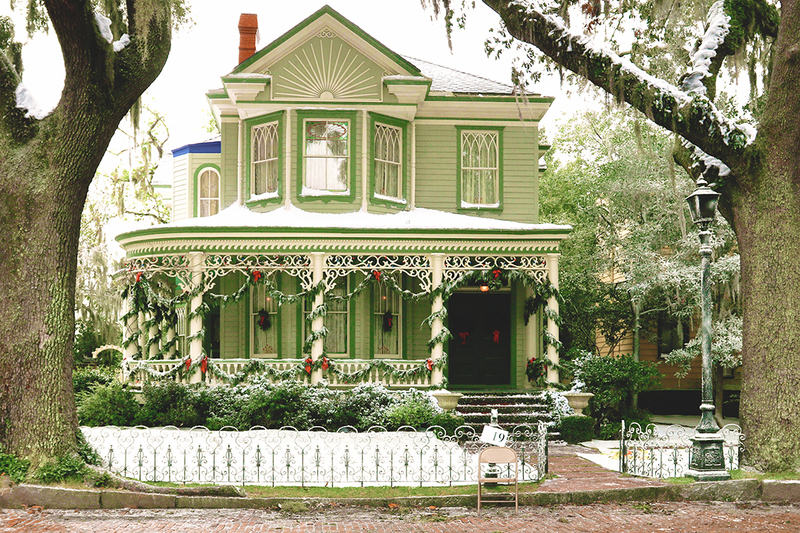 OK, now let's move on to a few of the most popular and well-known Victorian homes in all of Savannah. These beauties are amazing! I call these the Victorian Twins. The blue one on the right is currently listed for slightly less than 1 million. (What a bargain, eh? If you want to take a peek around the interior, it's pretty spectacular!!) I love when homes in Savannah are listed for sale and I'm able to take a virtual peek inside. I think the library room (photo #17 on the listing) is my favorite, but they're all impressive. The grey-blue house on the right is known as the Dickinson-Exley House, circa 1890. The green one next door is circa 1891. The homes truly are “twins” and utilize the same design plan. It's pretty spectacular to see them up-close and get a peek at all the details! They're located one block south of Forsyth Park. I can't imagine how much it would cost to maintain these homes. A new coat of paint alone would probably cost well over $10,000. The biggest expense I had for my house here in Savannah this year was a new metal roof, and that cost more than $18,000 when it was all said and done. The roofline on these two homes is much higher and the pitches are much steeper than my house, so I'd estimate it would cost more than $25,000 to have a new colored metal roof (like the red one on the Dickinson-Exley House) installed. Cha-ching!! 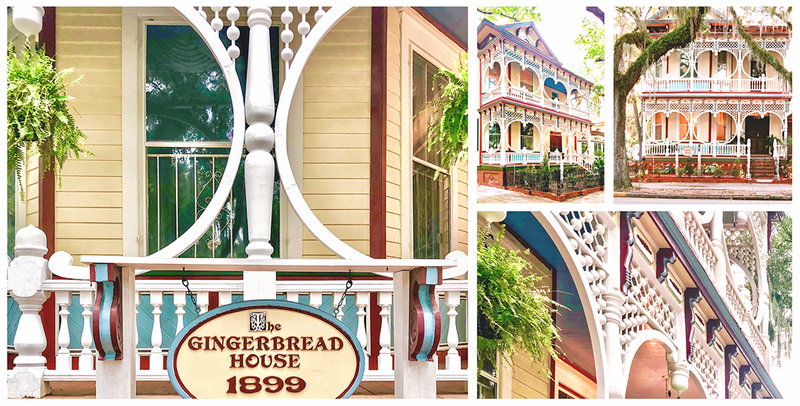 The Gingerbread House isn't technically in the Victorian District, but it's such a famous house that I had to include it in this post! It's a little less than 10 blocks south of Forsyth Park (I'd consider it more in the Starland District), and it's next to a great little coffee shop called Foxy Loxy. It currently serves as an event center, so if you're planning a wedding in Savannah you might want to check it out. They keep the gates locked, so you can only photograph it from the sidewalk. Photography Tip: To get a full shot of the front of the house without a tilted perspective, head across the street to the parking lot of the library. Savannah has developed into a movie-making mecca in recent years. Film companies are drawn to the area because it looks so old-fashioned — and because they get nice tax credits for filming here. No matter the time of year, you'll almost always find movie production crews in town. As I write this post, Disney is currently filming “Goodbye Stranger” in various parts of Savannah. It's a live-action remake of Lady and the Tramp, and I'm so excited to see it! I've watched portions of the filming, and I have to admit the period costumes are pretty incredible. I don't want to give away any production secrets, but I did ask a security guard if I could photograph what they're calling “Lady's House”, and she gave me permission! I want to include it here, because it looks very Victorian in style, and it's located within the Victorian District. This is “Lady's House” from Disney's live-action remake of Lady and the Tramp. The film crew added snow, because it was actually in the 60's here in Savannah on the day they were shooting the wintry scenes. How fun is it to get a sneak peek?! I'm so excited to see the movie and check out all of the local scenery through Disney's perspective. I'll definitely write a post showing more behind-the-scenes photos once the movie is released. As always, I'll aim to respect the “Disney Magic” by not revealing too much. The blue section on the roof is for CGI purposes. The crew constructed the section under it (with the curved window), so that isn't actually part of the original home. In the movie, the home will have an additional 3rd story in place of the current roofline. Betty Bombers – American-style dining in a retro setting (it's inside an American Legion Post building). It's a fun and casual place! Local 11 Ten & Perch – Try this if you're fancy (disclaimer: I'm not). The rooftop lounge at Perch has a nice atmosphere, but both of these are out of my usual price range for an evening out. The Sentient Bean – Coffee, vegetarian options, and Psychotronic Film Night!! If that description doesn't get you in the door, then I don't know what will. Sandfly BBQ – This is my personal favorite in the Victorian District. I love the brisket and their sauces are perfection. (Because I can't write a post without making a Friends reference.) They serve the food out of an adorable repurposed Streamliner. The Black Rabbit – Weird hours, but delicious sandwiches. They serve lunch options, but don't open until 3 — which means the place is perfect for night owls like myself. It's also a bar and has a small patio area out back. If you're a celebrity in town to film something and want to remain incognito, I suggest hanging out here! It's a great place to hide from the paparazzi. Maté Factor – This is quite a cozy little spot for drinks and baked goods. I love their Hibiscus-flavored green tea. Maté Factor, because it's too adorable not to post a pic! It's a cozy little spot to warm up on a rainy (or cold) day with a warm drink while snacking on delicious treats from the bakery. Is the Victorian District Safe? This is a common question within TripAdvisor's Savannah forum. You can see where I already answered it on this thread. 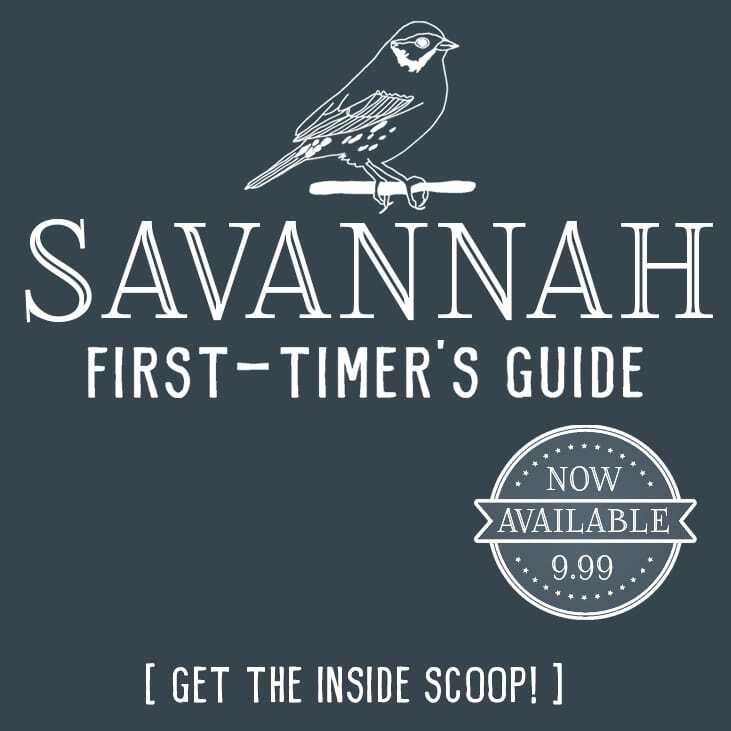 If you're new here, I've written an ebook, Savannah First-Timer's Guide, and in it I list the specific places in Savannah I think a tourist should avoid. FYI: The Victorian District is not one of them. Some areas of the Victorian District are transitional, but overall my opinion is that it's a perfectly respectable place for visitors to stay. You can see by the photos I've included in this post that most of the homes are beautiful and lovingly-maintained. FYI: Henry & Anderson streets are busy east-west streets with lots of traffic noise, which you might also want to factor in if searching for a home rental. There are lots of options bordering the Victorian District and within its boundaries. I'll list a few popular ones to help you decide. If you've purchased my Savannah First-Timer's Guide, don't forget I created a password protected page just for you that lists the pros and cons of every hotel and B&B in the Historic District. Here is the link: Savannah Historic District Hotels: The Inside Scoop! It includes a map where I divided the Historic District into 4 hotel zones and listed which zones are the party zones, which ones are more residential, etc. DISCLAIMER: These are not properties I've personally stayed in, since I own my own home in Savannah. I have visited and am very familiar with each location, I simply haven't stayed overnight in the properties. I suggest visiting Trip Advisor to read reviews from people who have actually stayed at the properties and can provide a more thorough assessment about the comfort level. As always, my goal is to be transparent and provide honest reviews about Savannah so you can make an informed decision regarding your visit! 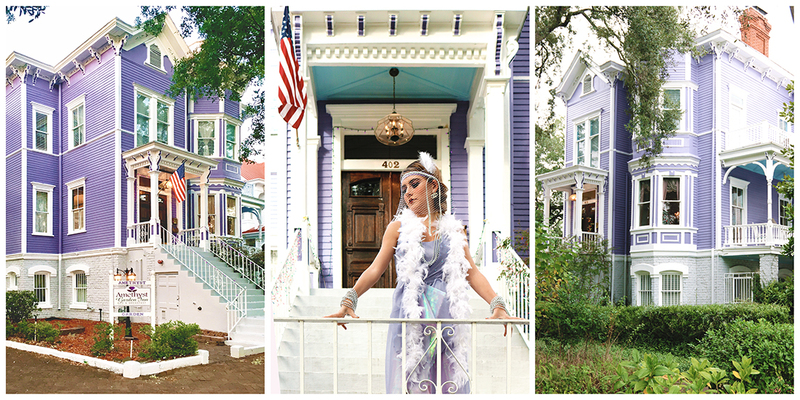 OK, so the flapper dress and the Victorian-era home aren't exactly from the same time period, but the front porch of the Amethyst Garden Inn makes a fun place for SCAD students (like my daughter, Daisy) to shoot their fashion project finals! At the Amethyst Garden Inn, the ceiling of the porch is painted in Haint Blue, which is the traditional exterior ceiling color on the majority of the homes in Savannah. Some tourists only want to stay in the Historic District when visiting Savannah. The following four options are close to the Victorian District, but are actually located within the ever-desirable Historic District. Amethyst Garden Inn: If you want to stay in a true historic Victorian property, the Amethyst Garden Inn makes a unique choice. Both the interior and exterior look like a dollhouse, and it's full of elegant Victorian-era furniture pieces. This one is for true fans of the Victorian era, because there are no phones or TVs in the rooms. Check rates. Forsyth Park Inn: This is a fantastic option that directly overlooks Forsyth Park. The views of the park from the front porch are pretty incredible. Check rates. The Mansion on Forsyth: This is a very popular hotel option here in Savannah. It's filled with truly incredible art! I love exploring the interior solely to look at the art — it's like taking a free stroll through a museum. Their “Century of Hats” collection is worth checking out even if you don't stay in the hotel. Multiple friends of mine have stayed here when they've come to visit me and highly recommend it. Check rates. Azalea Inn: It's located on E. Huntingdon, which is a pretty street. The inn has off-street parking and is located half a block away from Cuoco Pazza, the Italian restaurant I mentioned above. They also serve an incredible Southern breakfast at the inn itself. I love this option and recommend it frequently! Check rates. Catherine Ward House Inn: This is another fine choice and is the highest-rated option I've linked. It's Victorian without feeling too “stuffy”, if you know what I mean. (Basically, it doesn't feel like you're staying at your great-aunt's house that hasn't been updated in years; it's nicely updated and comfortable.) It's very popular with tourists, but I don't know anyone who has personally stayed here. I'd rank this one really high, if not tops, on the list of options to further explore. It's only steps away from Forsyth Park, so it's a very convenient location. Check rates. If you stay at the Catherine Ward House, you'll get to enjoy the bonus perk of looking across the street at these two beauties! Prefer staying in a home rental? Sanctuary Place is a very unique option! It was formerly a church and currently serves as a multi-unit rental property. You're welcome to use my $40 Airbnb credit on your first rental. I hope this post was helpful! If you're a Pinterest fan and looking for more inspiration, I update my Savannah Pinterest board frequently with my favorite local haunts. You can sign up for my mailing list below to download a printable checklist of 50 things to do in Savannah that don't require a car. What questions do you have for me about the Victorian District or Savannah in general? Gorgeous photos Erin! I grew up in St. Simons Island and studied Historic Preservation at UGA so I spent a lot of time in Savannah during grad school. Loved this little walk down memory lane! Love this! I live in Georgia and will definitely be revisiting this next time I’m in Savannah! 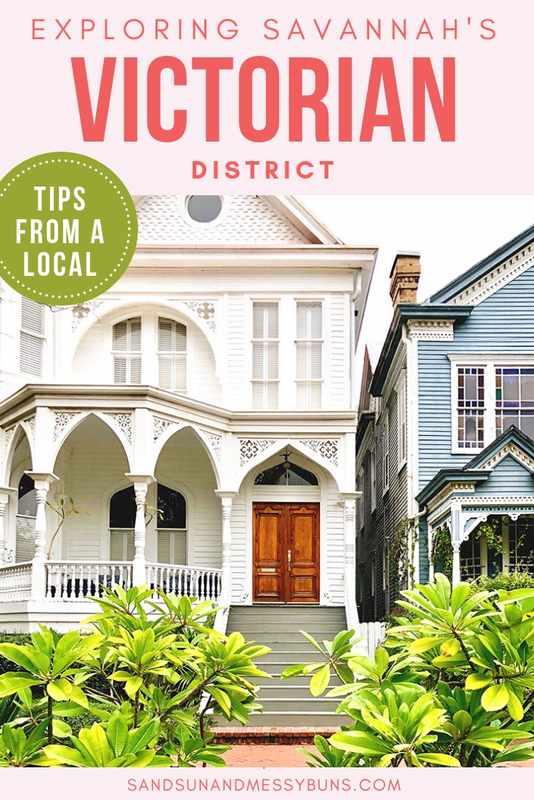 Yes, definitely check out the Victorian District — and the Starland District is fun, too! 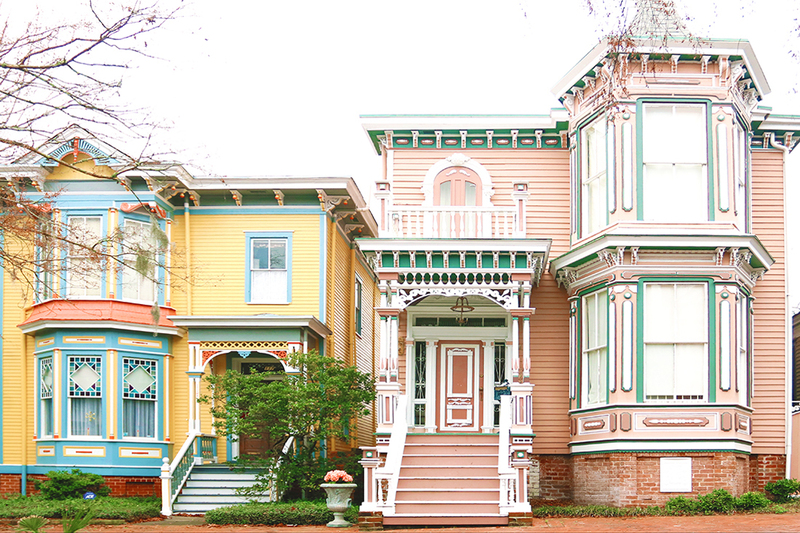 Savannah’s Victorian District looks so pretty, what incredible houses! I’m hoping to visit Savannah this year so am stoked to have found your blog with so much helpful information. I’m happy it’s helpful! If you make it to Savannah, the Victorian District is definitely worth at least a couple hours worth of strolling around. The homes are so detailed and even prettier in person.